Knowing how to make strawberry jam is a super simple way to take the leap towards self-sufficiency. It’s also pretty hard to mess up, making it a perfect first start to becoming more self-sufficient. Store bought jam doesn’t compare to jam made from fresh-from-the-garden strawberries, and if I can make it, so can you. 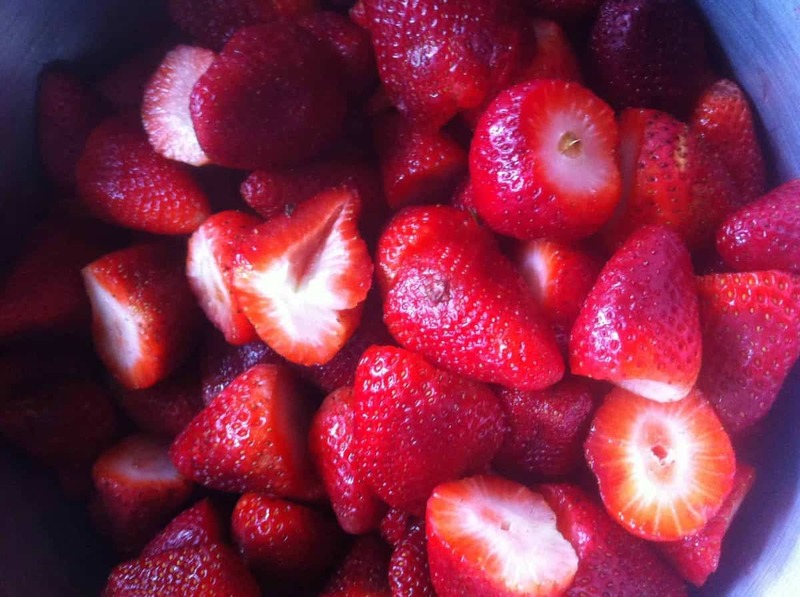 To make strawberry jam, I start out with about 10 cups of fresh strawberries. Cut off the tops, and set them aside (you can dry the leaves to use in teas, or feed the tops to your chickens, or compost them). Also be sure to cut out any parts of the strawberries that aren’t fresh. A lot of these strawberries were ok, but a couple had some not-as-fresh parts I cut out. Before you start liquefying the strawberries, you can cut them up to speed up the process, or you can leave them whole. I cut mine in half only, because I like large chunks of strawberries in my jam. If you want a smoother, more consistent texture, or to speed up the process, you can cut them up into smaller pieces. I’ve always used raw sugar for my jam, but you can substitute honey for the sugar if you don’t want to use it. The amount of sugar to use is dependent on your taste. I use 2 cups. 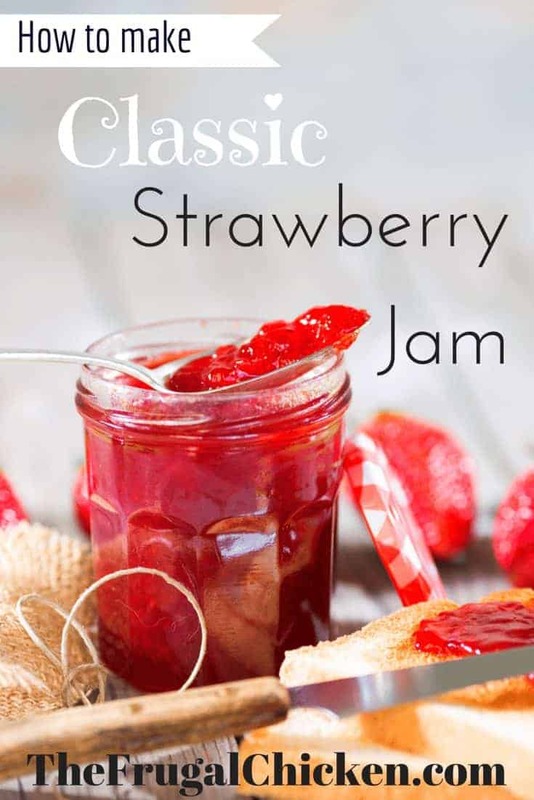 I don’t use pectin when making strawberry jam (I’m a “less is more” kind of person), although you certainly can add it if you want to speed up the gelling process. 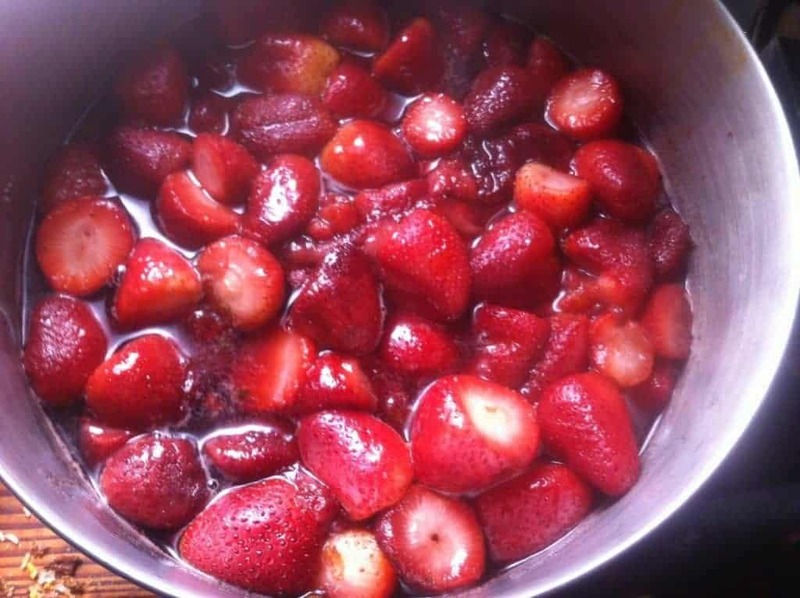 Add the strawberries to a large pot with the sugar, and turn the heat on medium high. When making jam, you’re breaking down the fruit and reducing the liquid so that it mixes with the sweetener. I let the strawberries take a while to break down, so I use a low heat setting. I tend to forget about food I’m cooking on the stove, and I’ve found using low heat prevents scorching (and kitchen fires). 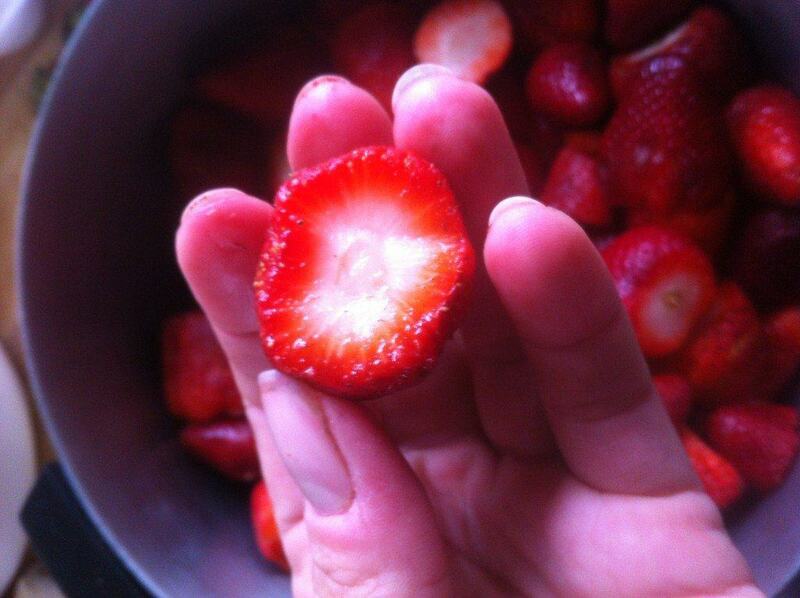 If you’re a good pot-watcher, using medium heat is fine, as long as the strawberries break down instead of cooking. Stir frequently to help the strawberries break down, and use a potato masher every so often as well. You’ll know when it’s time to start mashing because the strawberries will be very soft and there will be liquid in the jam. These strawberries have started the liquefying process. The amount of time needed to break down the berries depends on how much heat you use and how consistent you want your texture to be. When I make strawberry jam, it can take anywhere from 3 to 6 hours. My jam tends to be thinner and chunkier, which is how I like it; the process to make it remains the same regardless of whatever texture you’e shooting for. Once your jam is the texture you like, you can remove it from the heat and transfer it to the jars. Use sterilized jars (boiled in water for 10 minutes). This is important not only for your health, but also to make sure the glass doesn’t shatter in the process. The strawberry jam mixture will be very hot, and if the glass is cool, it might shatter. The jam will set and become more solid as it cools. Once your jars are cool, you can store them, or enjoy your homemade jam! 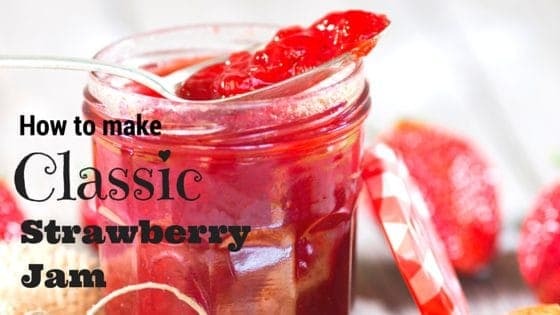 Making jam really is foolproof, and you can substitute the strawberries for pretty much any fruit you like, such as raspberries, peaches, or plums. I didn’t realize how easy it is.. Thanks for sharing!